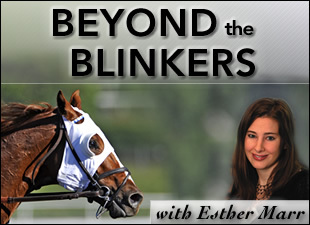 I would like to welcome back Shannon Hahn of Double L Stable Equine Rescue and Sanctuary in Argyle, N.Y., who I have featured several other times on Beyond the Blinkers. Over the years since I started this blog, Shannon has come to me with different stories of horses she has helped nurse back to health, rehabilitate, and re-home. This year, in light of Double L's upcoming Valentine's Day fundraiser, as well as the fact this will be the fifth story we have published about that operation, Shannon thought it would be a good idea to give an update on a former Double L resident that has now moved on to bigger and better things. I hope you enjoy the story and don't forget to send your Valentines to the horses! Also, I know it's already getting toward the end of January, but I have decided to give away another Blood-Horse calendar to a lucky reader. This year's calendar features many beautiful racing scenes from 2012, including such greats as Horse of the Year Wise Dan and European multiple champion Frankel. Leave a comment below about your favorite moment in racing from 2012 and I will select a winner at random next week. It is hard to believe it's been five years of The Blood-Horse readers helping Double L Stable's horses by participating in Double L Stable's Valentine's Day Card Fundraiser Contest. If you are new to this concept, for the past five Februarys, Beyond the Blinkers has featured a Thoroughbred who has entered into a new phase of life with the assistance of Double L.
Many fine horses have gone on to have great achievements and live long, happy lives. But some may question, does is always last? What becomes of them once they have settled in? Do they always stay put? Is the path they are set on the one they follow forever? 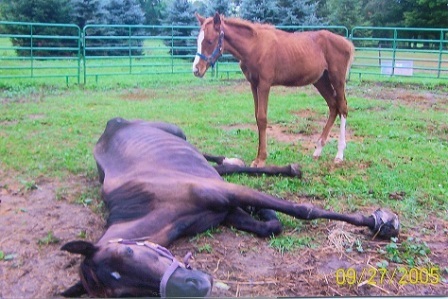 The very first horses featured for the fundraiser contest were Dawn (Windswept Lady) and her newborn foal, Willie, a son of Hammer (read the original story here). Readers were shocked as they learned of the abuse the mother and her colt endured at the hands of their former neglectful owner. Almost starved to death and unable to walk do to the neglect of her abscessed feet, Dawn fought to stay alive. 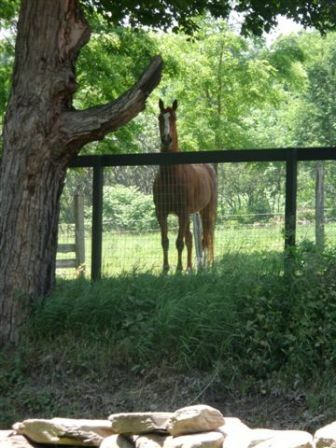 Willie, as he became known at the rescue, would never grace a track with his presence. In fact, due to his poor health condition it was not even known if he would grace the world with his presence for more than a few days after arriving at Double L.
While Windswept Lady eventually had to be euthanized due to her deteriorating condition, Will's health blossomed and he and spent his early years interacting with the handicapped and at-risk youth volunteers that frequent the stable. It was thought he may reside at Double L for the rest of his days. 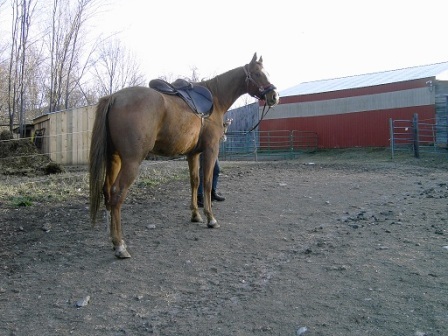 As the years went by and Will continued to grow physically and mentally, Shannon recognized that the large, 17.2-hand chestnut gelding had the potential for greatness, but she did not possess the skills to unlock that talent. Little did Shannon realize that a woman named Catrina she had emailed with three years prior would be the right person to eventually work with Will. A native of England, Catrina had inquired about temporarily boarding her Irish Warmblood horse at Double L until the farm she had bought with her husband was ready. Shannon explained that Double L did not board horses as a rule but if she had no luck elsewhere to contact them again and they would try to help out. It was around a year later at a Double L fundraiser when Shannon was formally introduced to Catrina or "Cat" in person and the two women became friends. 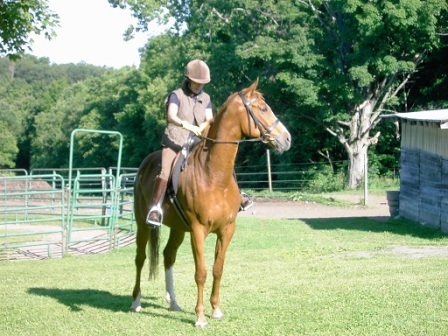 "Cat is a wonderful rider who enjoys the challenges of riding sidesaddle," said Shannon, who during that time had put out feelers for people who might be able to start Will's formal training and get him going under saddle. She explained that one by one, local folks who were sure they could handle the towering gelding came out to the farm only to have Will snub them or let them know by extending himself to his full height he was not interested in working within the parameters of their training styles. Shannon started to think it was hopeless. "The magnificent creature the sickly little baby had grown up to be did not have a nasty bone in him--he loved being the center of attention, and yet he turned down trainers one after the other," she said. "It was becoming disheartening. "I knew with the right person Will could be a fabulous ambassador for rescue horses. He could really show the world what 'rescues' could become. He would clean up at shows, he would sweep every class he was entered in, he would wow the crowds with his regale aura, but first he needed to learn to wear a saddle..."
Last winter, Shannon's friend Cindy called and explained how Cat had recently lost her horse and asked if she could be considered as the right person to work with Will. "I figured what could it hurt?" said Shannon. "I had met Cat before and she seemed like a very nice lady but would this petite woman be able to handle this immense steed?" Luckily, Will seemed enthralled by Cat's training techniques, and the relationship between the horse and rider blossomed as the months passed. Even when snow postponed their training for a few days, it didn't seem to faze Will. "He retained every bit of information Cat offered him and picked up each time as if no lapse had occurred at all," said Shannon, adding that she knew at that point that Cat was Will's "forever person." In the spring, Shannon and her husband Aaron helped Cat and her husband Steve build a new stall for Will so the horse could reside at their nearby farm. In time, Cat began taking Will on short trail rides, with Shannon occasionally accompanying them aboard one of Double L's Arabians. "Will became a confident lead horse rarely spooking and building up his level of assuredness with each word of praise Cat offered him," said Shannon. On a warm day in June, Cat decided to make the six-mile trek from Double L to her farm with Will. The only problem the pair encountered along the way was being chased by a couple of farm dogs, after which Will took off in a full gallop across a corn field. After a few harried moments, Cat was able to regain control, and the pair retraced their footsteps back to the road. They arrived home in fine shape and Will continues to thrive under Cat's care and training. While Will isn't quite ready to show sidesaddle this year, he will get there, said Shannon. "After all, look how long it took for his Cat to arrive here from across the pond and find her way into his life," she noted. Added Cat: "He's a brilliant horse to work with--he's so eager and willing to learn. I treat him like a man, and then I make him think he's doing everything right," she said with a laugh. "He's a very big lad--he's much bigger and stronger than me, so we have a mutual respect of each other that seems to work really well." Cat said she's taking things slow with Will and hopes to have a sidesaddle on him by the spring. "I'm just hoping to get the best out of him that I can...but there's no rush," she explained. "We're putting jumps up on the farm for him and he goes for everything, so every day is new excitement. He's incredibly intelligent and willing." To contribute to Double L's annual Valentine's Day Card Contest Fundraiser, send a Valentine to the horses of Double L and include a single $1 bill. "You may include more of course of you like, but a single $1 bill will enter you in the contest," explained Shannon. Each card will be hung in the barn for visitors to see, but they must be postmarked by 3/3/13 to qualify for the contest drawing. At the end of the following week a winner will be drawn to receive a $25 Tractor Supply Co. gift card. Or for more information about Double L, visit www.doublelstableequnerescue.petfinder.org. Also, don't forget to leave a comment below with your favorite industry moment from 2012 for a chance to win a 2013 Blood-Horse calendar!